Sticky Theme // Choose a theme that is easy to understand and spread. Ideally, you will leverage existing “cultural influences” that lend themselves to visuals, language and themes. The theme should be clear, not clever. 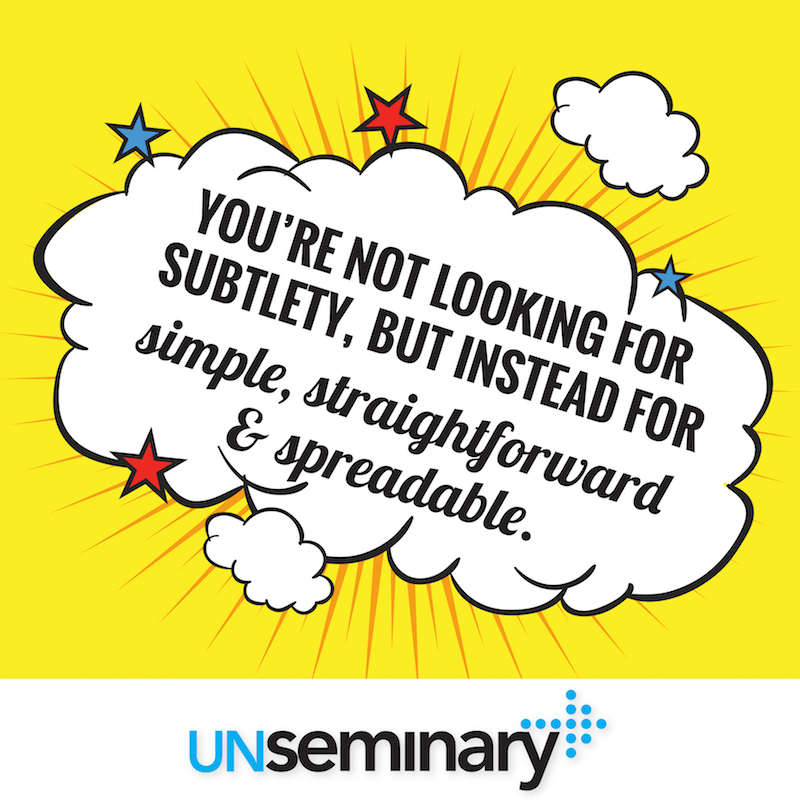 You’re not looking for subtlety, but instead for simple, straightforward and spreadable. Guest Speaker // I’m convinced a guest speaker is a critical piece of the “Wow! Weekend” puzzle. Guest speakers typically have a message they’ve done a bunch of times, which means they will deliver a high-quality experience for your guests. 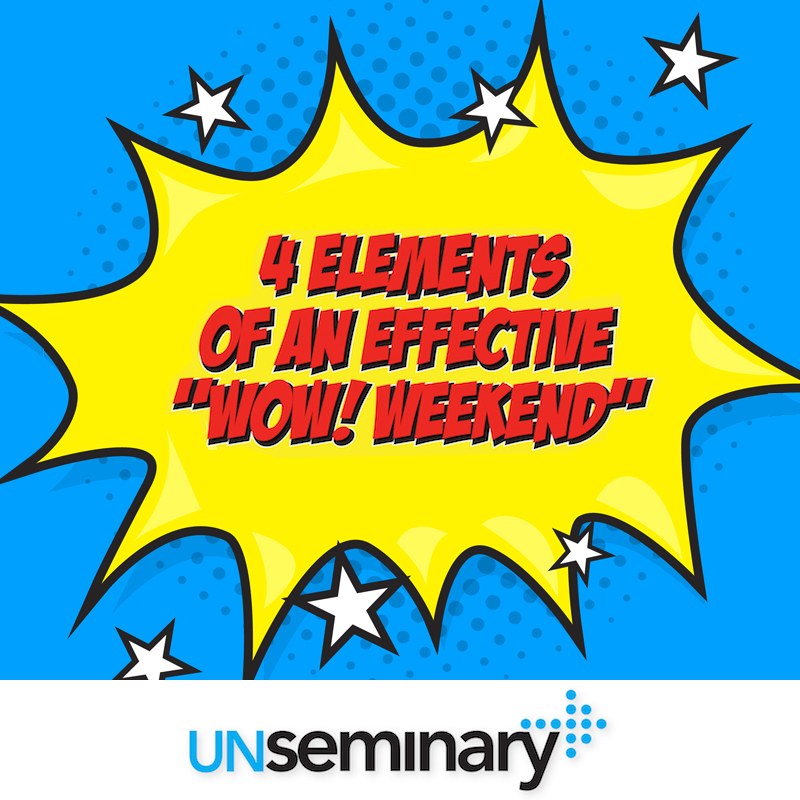 On top of that, the fact the guest speaker is only there for a weekend creates urgency for people to invite friends before that weekend. A deadline moves people towards inviting. Clear Next Steps // You need a systematic way to follow up with first-time guests who come to this weekend. You’re going to work hard to ask people to invite their friends … be ready for it and ensure a multiplicity of ways to follow up with the guests. Time the “Wow! 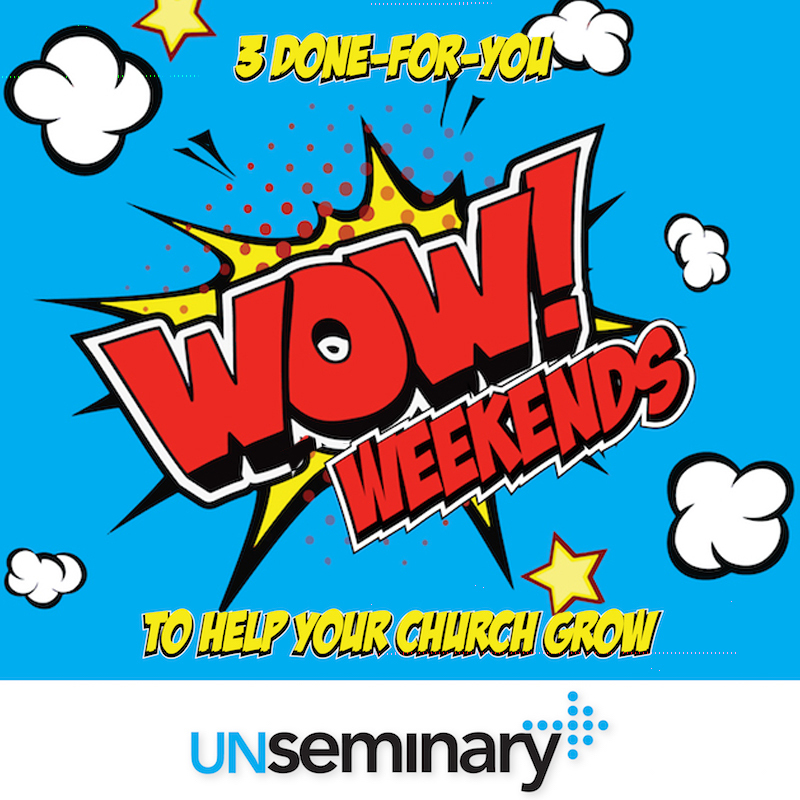 Weekend” so it leads into the next season of ministry for your church. Point to whatever is “coming up next” during the weekend and ask your guests to come back. A “Shocking” Element // People talk about stuff that is different. If it seems like the “same old, same old,” people won’t tell their friends about it. The entire weekend needs to be different enough that people will say something like, “You won’t believe what they’re doing at my church … you gotta come hear …” or “I know it sounds amazing but we’re having this weekend at my church where …” Ideally, these weekends have a hook that makes people chuckle, wonder, get curious, lean in and want to learn more. We’ve pulled together resources from 3 “Wow! Weekends” from Liquid Church for your use. Promotional graphics, message samples, speaker contact information … everything you need to “plug and play” a great weekend at your church. I’d strongly recommend picking one of these and add it to your upcoming calendar. Blurb: How do we know the Bible is telling the truth? Are the Gospels reliable eyewitness testimony? Join us for a special investigative series featuring homicide detective J. Warner Wallace as he applies his cold-case investigation skills to the Bible! 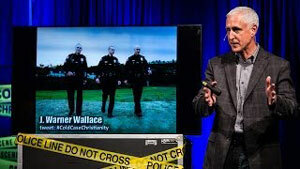 Speaker Bio: Wallace was a conscientious and vocal atheist throughout his undergraduate and graduate work in Design and Architecture (CSULB and UCLA); he always considered himself an “evidentialist.” His experience in law enforcement only served to strengthen his conviction that truth ties directly to evidence. But at the age of 35, Wallace took a serious and expansive look at the evidence for the Christian worldview and determined that Christianity was demonstrably true. After becoming a Christ-follower in 1996, he continued to take an evidential approach to truth as he examined the Christian worldview. He eventually earned a Master’s Degree in Theological Studies from Golden Gate Baptist Theological Seminary. Blurb: Invite the football fans in your life to join us for TAILGATE SUNDAY at our church next Sunday! Special guest Keith Davis, former NY Giants linebacker and 2-time Rose Bowl champion will be speaking at our church. Keith will share how faith helps overcome obstacles on the gridiron of life. We’ll be wearing our team colors … we’d love for you to WEAR YOUR FAVORITE TEAM JERSEY! Speaker Bio: Keith Davis is a former college and professional football player who has appeared on ESPN and ABC, and in USA Today and Sports Illustrated. He is also an entrepreneur, educator and speaker, having spoken in over 9,000 schools, universities and corporations. Keith has travelled and presented in over 51 countries, including Australia, India, Japan, England, Germany, Russia, Venezuela, Bolivia, Brazil, Egypt, Niger, Zimbabwe and South Africa. Keith graduated from the University of Southern California with a degree in Business Finance, during which he held the football team’s highest grade point average. While playing football at USC, Keith was the team’s leading tackler and an All-Conference player. He was also selected to the All-American Strength Team, and played in one of college football’s biggest and most exciting games, the Rose Bowl. He has won 2 championship rings. 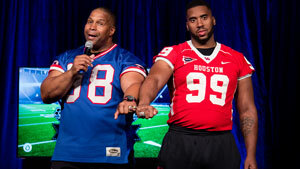 After college, Keith signed his professional football contract with the New York Giants. Keith was one of the strongest players in the nation. He stands 6’1″ tall, weighs 290 pounds, and bench presses over 515 pounds and leg presses 1,800 pounds. 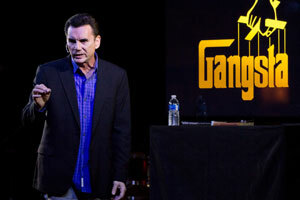 Blurb: Come and hear the incredible story of Michael Franzese, a former mob boss for the Colombo crime family. Learn how this “Goodfella” became a “Godfella” with a mission. Speaker Bio: Just a few years ago, Michael Franzese was “one of the biggest money earners the mob had seen since Al Capone, and the youngest individual on Fortune magazine’s survey of the ‘The Fifty Biggest Mafia Bosses'” (Vanity Fair magazine), ranking #18, just 5 spots behind John Gotti. His autobiography Blood Covenant covers his early days in the mob, his rise to power, and the Damascus Road experience that changed his life forever. It led him to do the unexpected and the unbelievable: quit the mob and follow Jesus. PDF Download, Print & Pass along to friends.